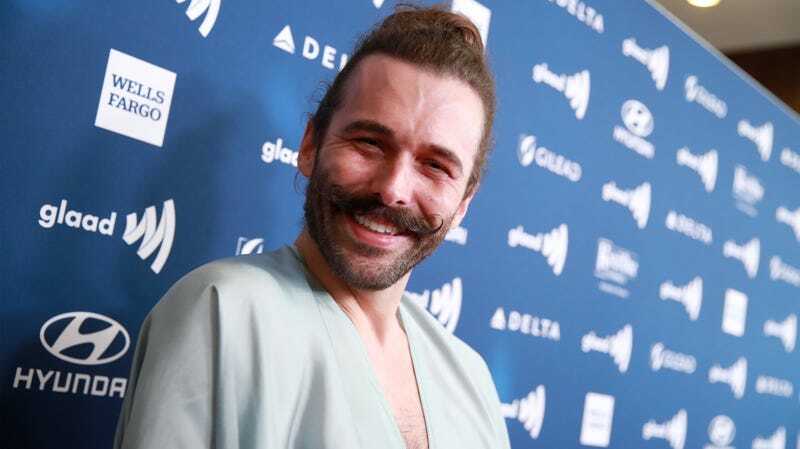 Before changing the world one deep conditioning treatment at a time on Queer Eye, Fab Five favorite Jonathan Van Ness was doling out curl sets and shaky-but-entertaining Game Of Thrones recaps on the Emmy-nominated Funny Or Die series, Gay Of Thrones. While his appointment book may be a little cramped these days (and may or may not include the occasional visit to Nancy Pelosi’s office), it looks like he has no problem penciling in one final season of the online series. Can you believe?! Per a report from Entertainment Weekly, Gay Of Thrones will return to Funny Or Die on April 16 with new episodes arriving every Tuesday. The short, JVN-esque recaps have aired alongside Game Of Thrones since season three and have remained a relatable method of getting acquainted with the vastness of Westeros and Essos, one convenient character nickname at a time. The show has seen a number of special guests like D’Arcy Carden, Margaret Cho, Lucy Davis, and even George R. R. Martin himself. Since its inception, Ness and company have earned two Emmy nominations for Outstanding Short Form Variety series in 2016 and 2018.